Ready for a rockstar night out? Join us Thursday, November 1st for a legend-worthy VIP Night! The night will include an early screening of "Bohemian Rhapsody" starring Rami Malek. 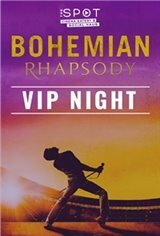 As a VIP at this exclusive event, you will not only be one of the first to see the film, but will also enjoy a rockstar-worthy evening of hor d'oeuvres, desserts, champagne, music, and more!